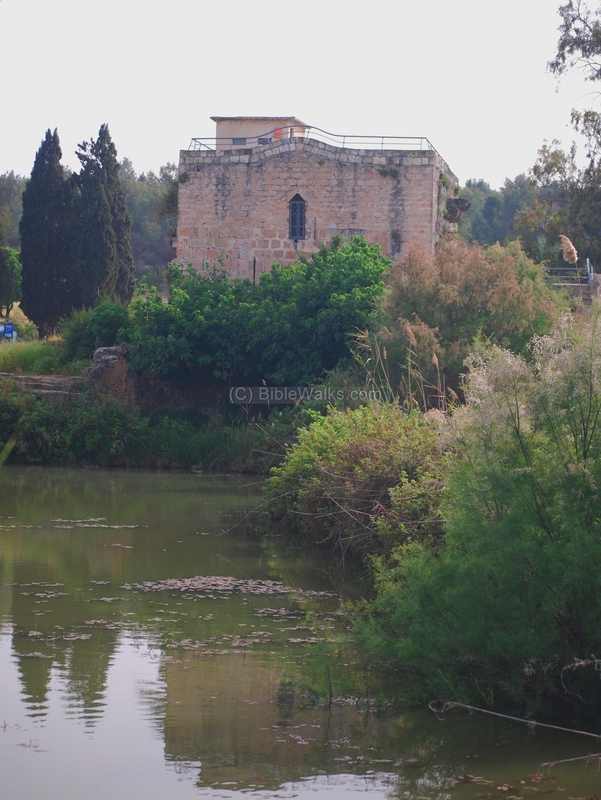 Tel Afek is a Biblical city on the ancient Via Maris road, south to Acre, and its springs are the sources of the Na'aman river. Joshua 19: 24, 30: "And the fifth lot came out for the tribe of the children of Asher... Ummah also, and Aphek, and Rehob"
The site is located on the ancient road of Via Maris, the major highway that connect Egypt to Syria and the north. 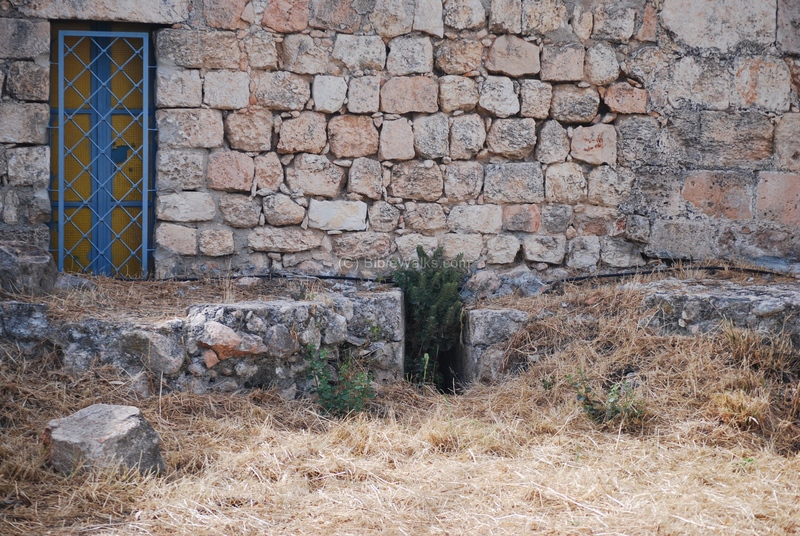 On the south side of the site is a Tel (mound), the site of a Biblical city (Afek, Afik). Nearby are the Afek springs, a total of 30 springs, which are the source of the Na'aman river. On the north side are the ruins from the Hellenistic/Roman periods, and a two-story fortified building from the Crusader period. A set of flour mills once operated on the lower floor of the building. 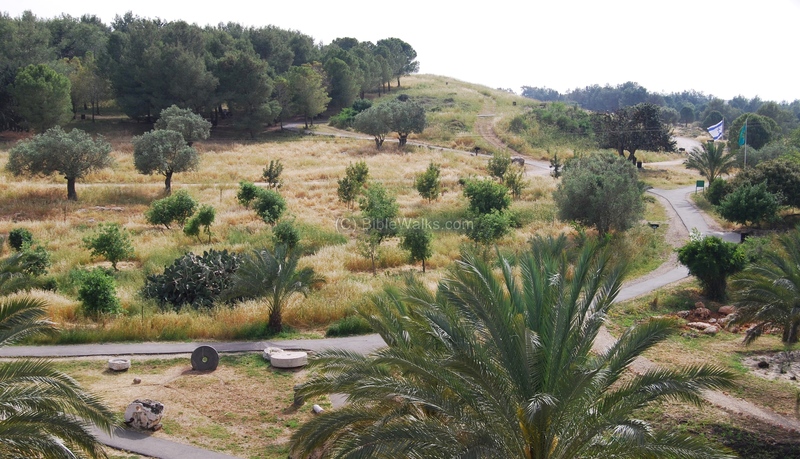 Today the site is part of the Afek nature reserve park. The site is located in the plains south to Acre, and is 43M above sea level. The ancient Via Maris road from Acre passed at this point, and split south (through Tel Zavat) and east (towards Sepphoris and Nazareth). The site is a nature reserve park, and can be reached from Kiryat Bialik with an entrance on the south-west side. The highlights of the park include the Crusader fortress and the natural water canals and lake, which draw their waters from the year-long flowing springs of Afek, which are the sources of the Naaman river. Note that in Israel there are other Biblical sites with the same name: in the Sharon (Rosh Haayin) , in Jezreel valley (Gilboa area), and in the Golan (on the Syrian border, east to the sea of Galilee). Below is the aerial view of the area from the west side. Pointing on purple points will automatically scroll to the relevant photo, text or web page. The round hill in the south of Afek was a walled city during the Middle Bronze period (2200- 1550 BC). Its massive walls were built in that period, and sections of the walls can be seen around the south side of the hill. According to the Bible it was strongly defended and did not submit to the tribe of Asher. 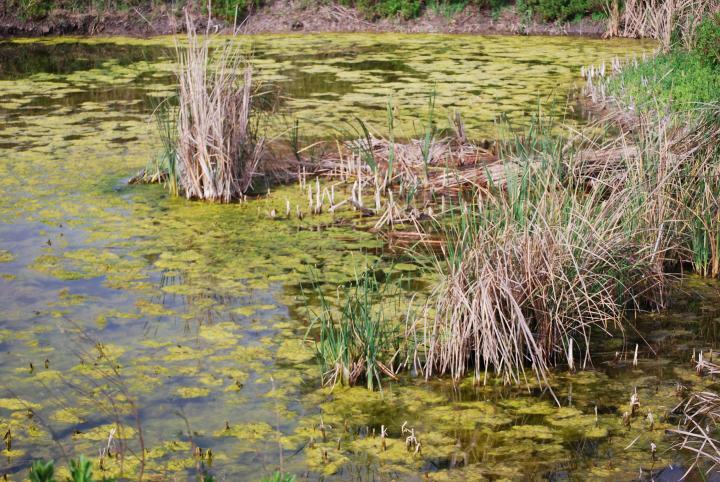 Its defense line was probably assisted by the lakes around the site. 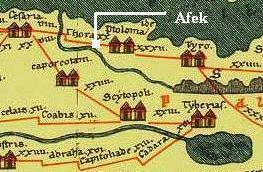 A Biblical map is shown in the map below, with the city of Afek/Aphek in the center of important trade routes (Via Maris to southeast, southwest, and north) . 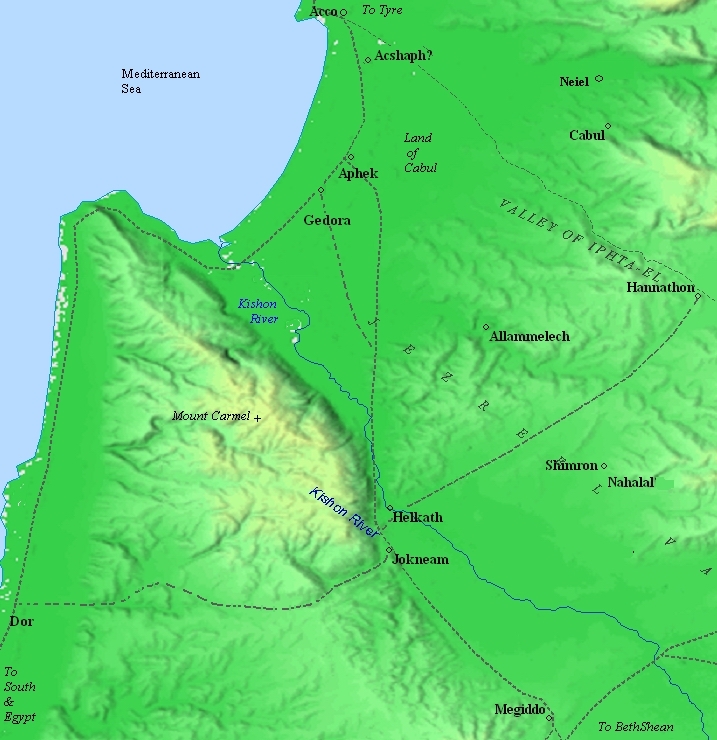 The city continued on to the Iron/Israelite period (1200-732BC), and was probably destroyed in 734BC by the Assyrian King Tiglath-Pileser III, who annexed the area (as per 2 Kings 15: 29: "In the days of Pekah king of Israel came Tiglathpileser king of Assyria, and took ... Galilee...and carried them captive to Assyria"). The Assyrians came through Tyre and Acre, systematically burning most of the Israelite cities (as revealed in Hazor and Megiddo), and killing or exiling the population. After 400 years the city was rebuilt, but not on top of the ancient city. 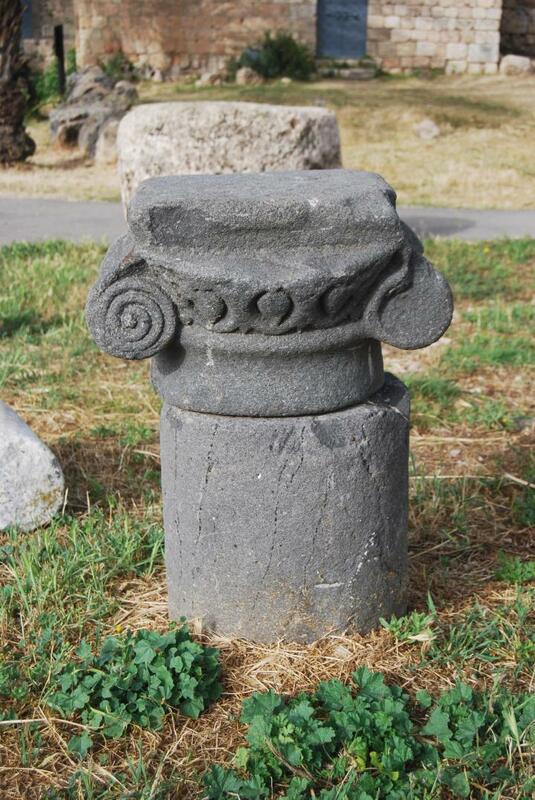 The population relocated during the Hellenistic period (3rd to 1st C BC) to the newly founded city on its north side. This was an urbanization pattern that occurred in the whole ancient world, and most of the Tels "died" (see more). 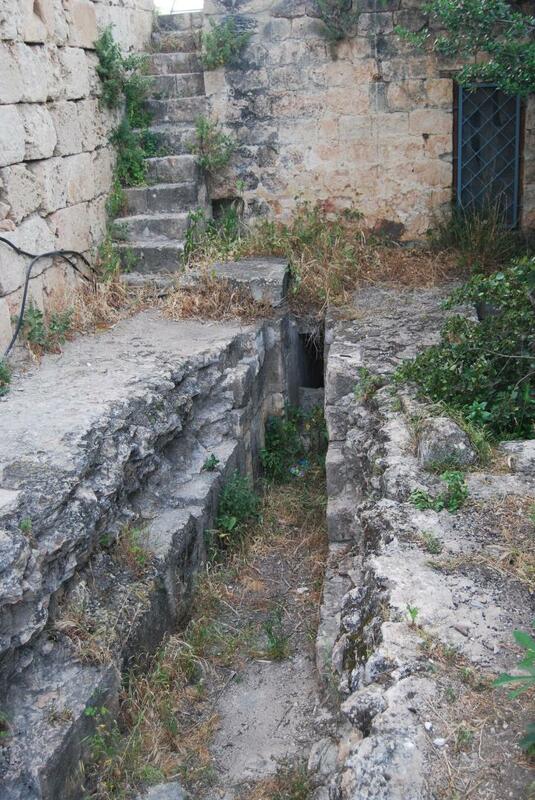 The Hellenistic city was built on a lower level on a larger area, reaching the springs. The city continued to prosper during the Roman and Byzantine period, and continued until the 8th C AD. Its strategic position along the main Roman roads made it important, although it was a small town. 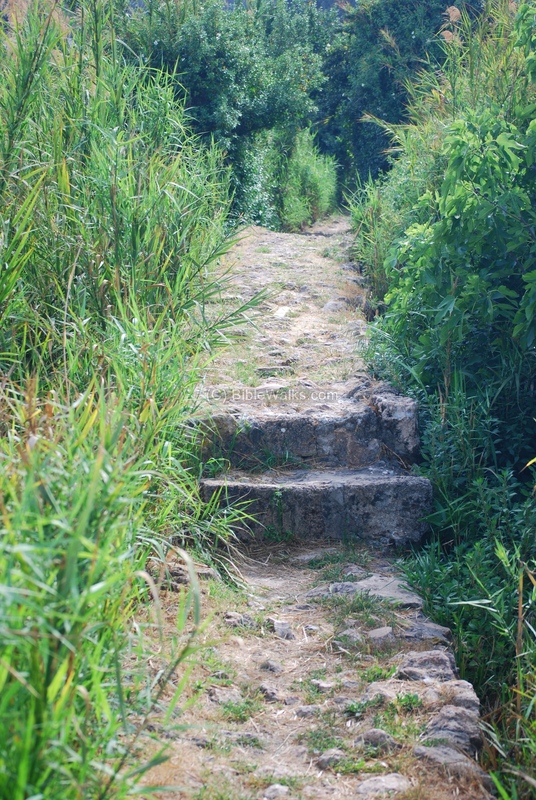 The Romans perfected the art of road building, and enabled them to effectively manage the vast empire by improving the links between the cities, especially for military purposes. The Peutinger map (Peutingeriana tabula) of the 4th C Imperial Roman roads shows the coastal way from Acre ("Ptolemaide" in the top center) through Dor ("Thora") to Caesarea Maritama ("Cesaria" on the top left). The position of Afek is shown on the map, close to Acre. The cross road that passed at Afek through Usha on the way to Sepphoris and Megiddo is not shown, but is important as well. The roads were constructed during the times of Nero Caesar (54-68). Parts of these roads were recently excavated near Tel Kisson, Zivda and Zavat. 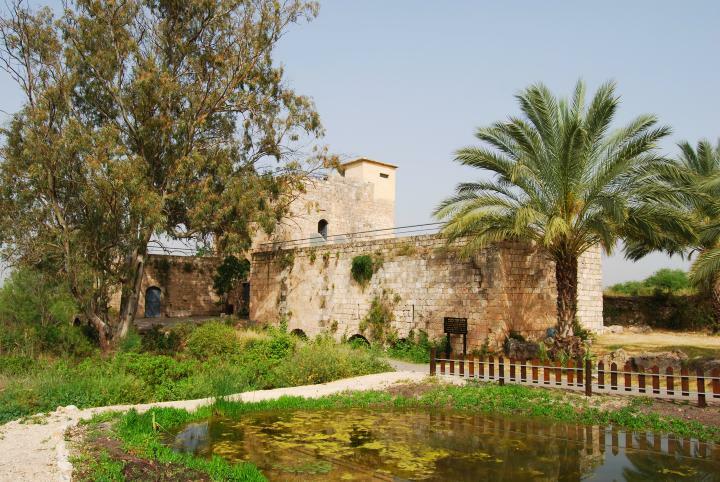 In the Crusaders times (12-13 C AD) the north area was fortified to protect the route to Nazareth. A two story Crusader fortress still stands here. 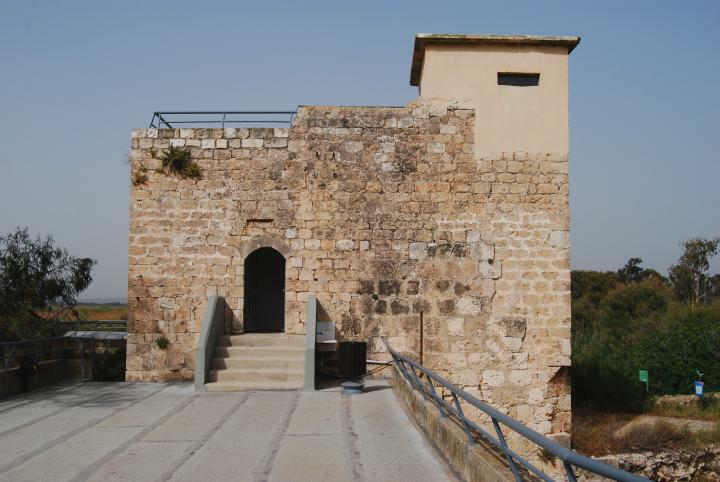 This type is known as a Crusader Turris - a fortified tower - also known by its Arabic name as Burj. The fort was named Recordane or Ricordane. The Crusaders camped here and used it as a base to combat the Muslims. During the sixth Crusade (1228), King Friedrick II set up his headquarters in Ricordane and negotiated a deal with the Arabs, earning the Crusaders a 10 year truce, while taking in possession the major cities of Jerusalem, Nazareth, Sidon and Bethlehem. A set of flour mills operated in its lower floor, operated by the water, and was constructed by the Crusaders of the Templars and Hospitallers order. They constructed a dam in order to provide the waters for the mills, raising the height of the water by 2.7M. 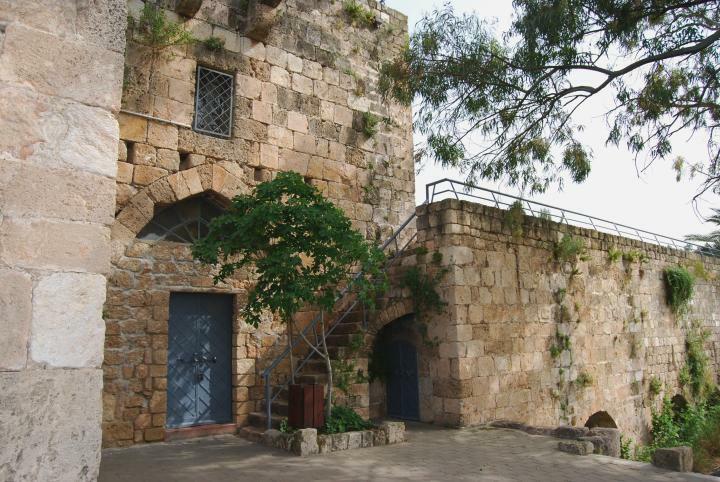 The mills were the main source of flour to Acre, the Crusaders major city and later their capital. The flour mills were destroyed by the Mamlukes (14th C) but reconstructed later by the Ottomans, and operated until 1925. They supplied flour for the Turkish army during WW I. 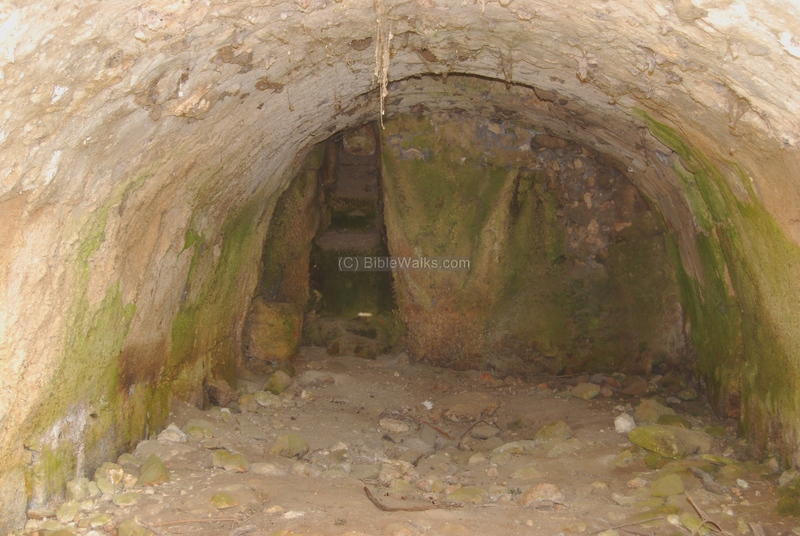 The site was named Kurdani, preserving the Crusaders name. The British diverted the water to the newly constructed oil refineries. During the Arab riots (1936-1939) they defended these water works by building a guard post on top of the Crusaders fortress. The swamps around the area were dried out in the 20th C, which removed the hazard of living in the area. This enabled a new Jewish settlement in the area. 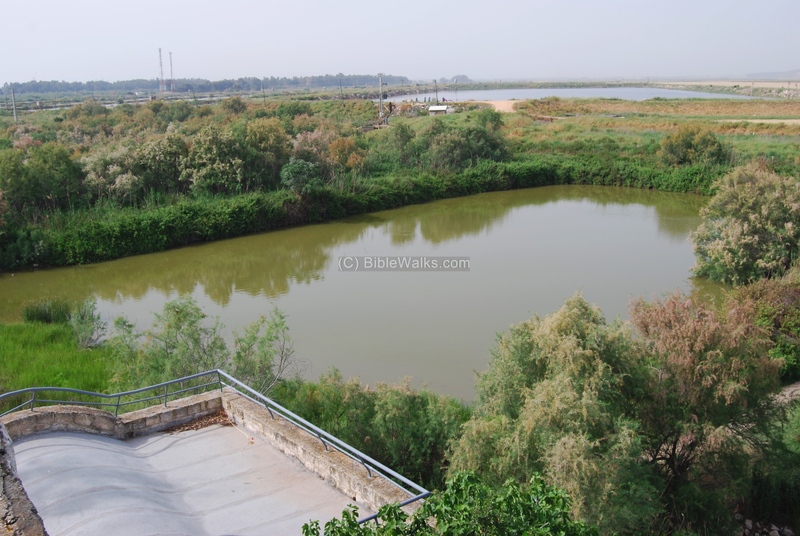 During 1934-1947 the first fish breeding project was conducted in the lakes of Afek, pioneered by Branco Zitzer, which established this important agriculture branch in Israel. A photo (courtesy of the Library of Congress, Matson collection, dated 1939) shows the "Tell Karaneh springs" fish farm as an example of a new Jewish factory. The subtitle was: "Ozone apparatus used in connection with the transportation of live fish". A Kibbutz with the same name, Afek, was established in 1939 in the area north-east to the site. 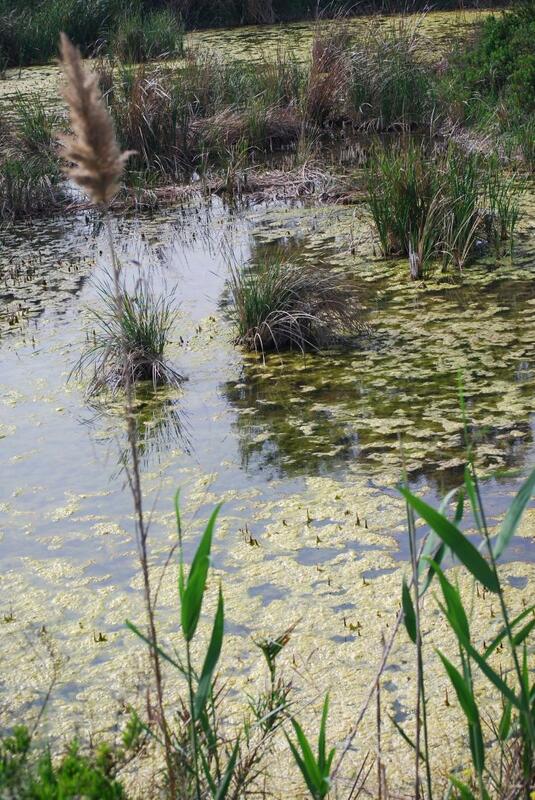 Today, the site is a nature park (Ein Afek), with an observatory of the wild life in the lakes and the swamps. Its size is 310 Dunams. On its south-west side of Tel Afek is a modern cemetery which serves the population of the Krayot. In 2017-2018 a new neighborhood of K. Bialik north is in the process of construction on the west side of the nature park. 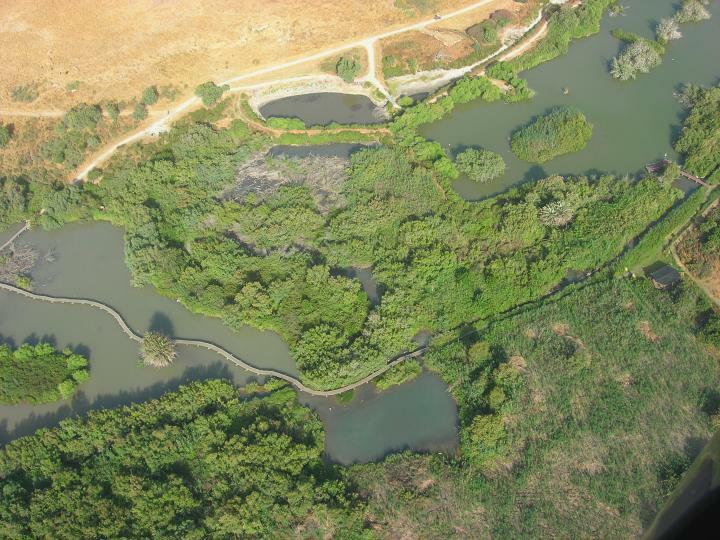 This aerial view, captured by a quad copter 70m above the south-east side, shows the top of Tel Afek on the left. To the right of the hill are remains of the Hellenistic/Roman city, yet buried under the ground. On the far right, hidden behind the trees, is the Ein-Afek nature park, a Crusader fortress and flour mill. Major highways pass near Afek: Highway #79 traverses its south side, eastwards towards Nazareth and Tiberias. On its west side, seen on the top side of the photo, and along the houses of Kiryat Bialik, is the new north-south highway #22 ("Okef Krayot"), which follows the ancient south-north Via Maris route. On the south side of the park is a high round hill, which is the tip of the Biblical Tel. It rises to a height of 43M above sea level. The hill, and the area around it, is composed of many layers of ancient cities that were built one on top of each other over 2 millenniums, from the Bronze period up to the Persian period. 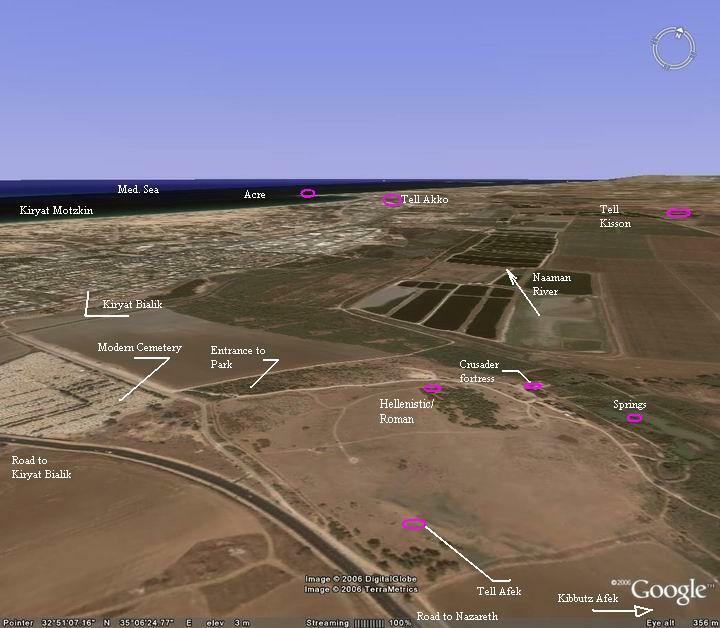 The photo below shows the area in the north side of Tel Afek, which was part of the Hellenistic/Roman city. The Hellenistic/Roman/Byzantine city was partially excavated. Some of its remains are exhibited in the park, such as the capitol of a pillar seen below. The structure seen below is an ancient two-story Crusader flourmill and fortress, which is located near the lakes on the north-west side. The flour mills were in operation during the Crusaders period (1099 until 1291), and destroyed by the Mamlukes (end of 13th C). The Ottomans rebuilt the flour mills and they were in use until 1925. Another view of the flour mill complex. The water outlets are seen on the bottom of the structure. One of these arched water canals is seen in the photo below. The water flowed through the canal with the force of gravity, turning a vertical shaft. It spin around, turning a grinding stone on top of a base stone. 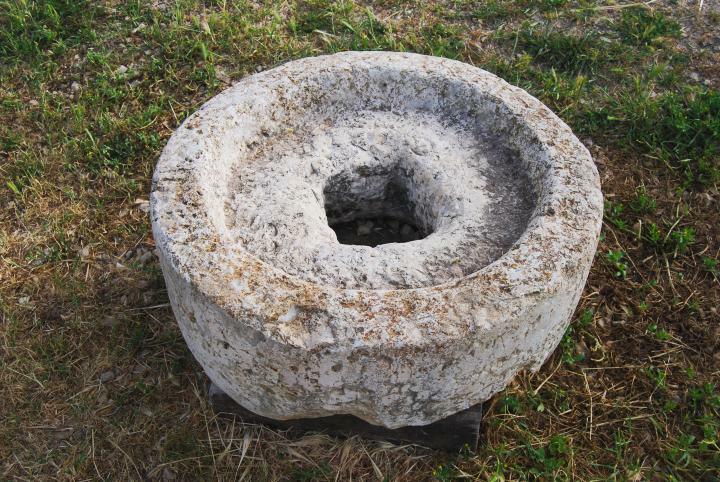 This grinded the wheat grains, turning them to flour, which was then sold to the bakeries in Acre. The water pushed into the mill by a number of canals which are located on the eastern side. One of the inlet canals is seen below. Another inlet canal is seen below, located on the north-east side of the structure. A crushing stone, perhaps part of the flour mill, is seen in this exhibition. 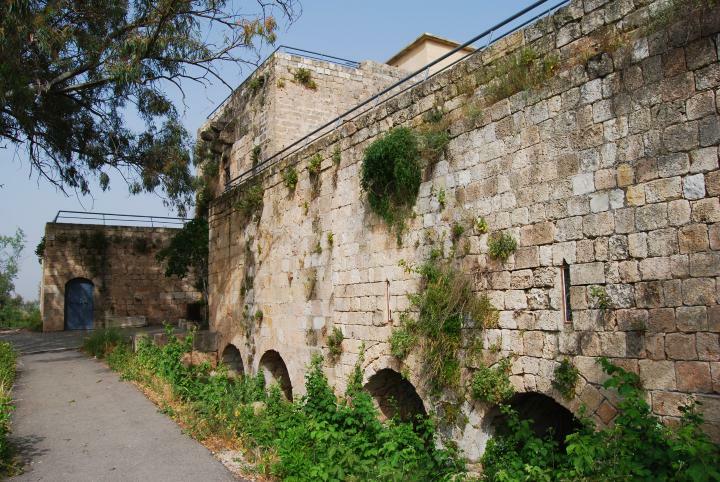 The Crusaders built a dam in order to raise the water level and divert the waters through the mill. This was done with a series of canals and a 630M long wall. The photo below shows the pool on the eastern side of the mill, where the water entered to the inlet. In the 1920s the British added more canals and redirected them to the structure on the right side, where the waters were pumped and delivered to the Haifa refineries in the bay of Haifa. You can walk through the park on top of these ancient walls. The Crusader fortress was later used by the British as a guard post during the 1936-1939 Arab riots. The guard post protected the water supply for the British oil refineries located in the bay of Haifa. The photo below shows a view from the fortress towards the north-west side. Another view of the fortress is seen from the north side. A large water pool located on the west and north side of the structure was part of the water system of the Crusaders flour mills. 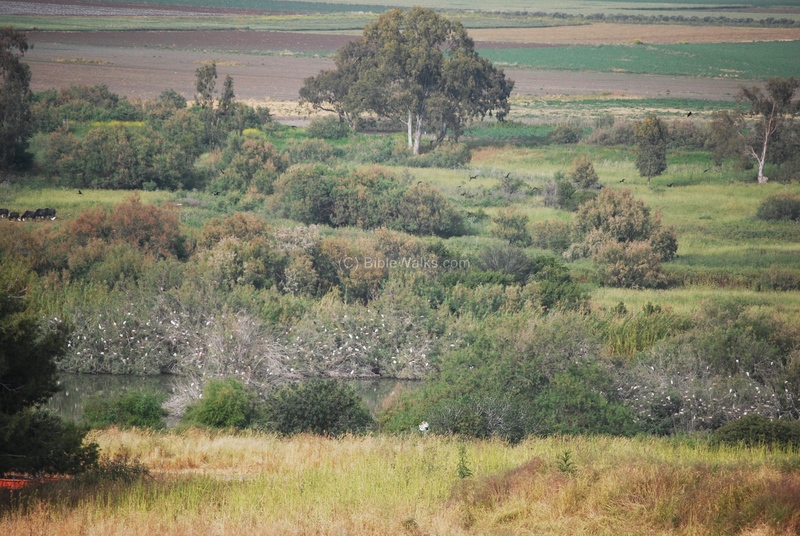 The major portion of the Afek nature park include the lakes and swamps, located on its north-east side. This view was captured by a quad copter from the south, and shows the plan of the park. 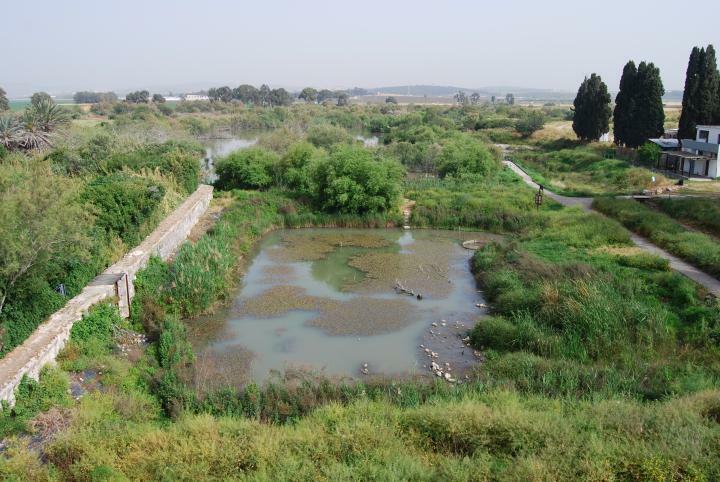 The nature park draws its waters from the year-long flowing springs of Afek, which are the sources of the Na'aman river. Walking around the pools is a fascinating experience, as can be seen for a sample of these photos. 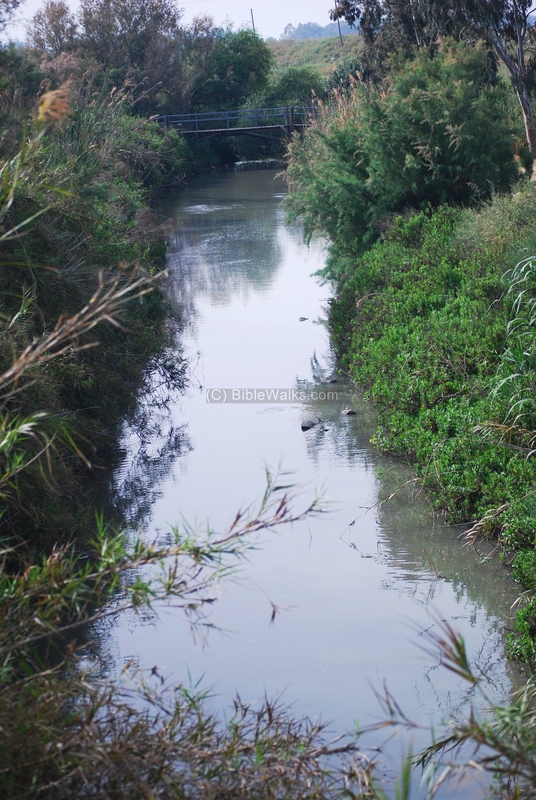 The photo below shows one of the main canals that flow into the Na'aman river. Yet another view of the nature park. The following photo is an aerial view of the largest lake. A board walk allows the visitors to cross the lake. The nature park is visited by a great number of birds. Israel is situated at an intercontinental junction - between Europe, Asia and Africa. It is a bottleneck for bird migration routes. An estimated 500 million birds pass through every spring and autumn, with over 500 species in record. 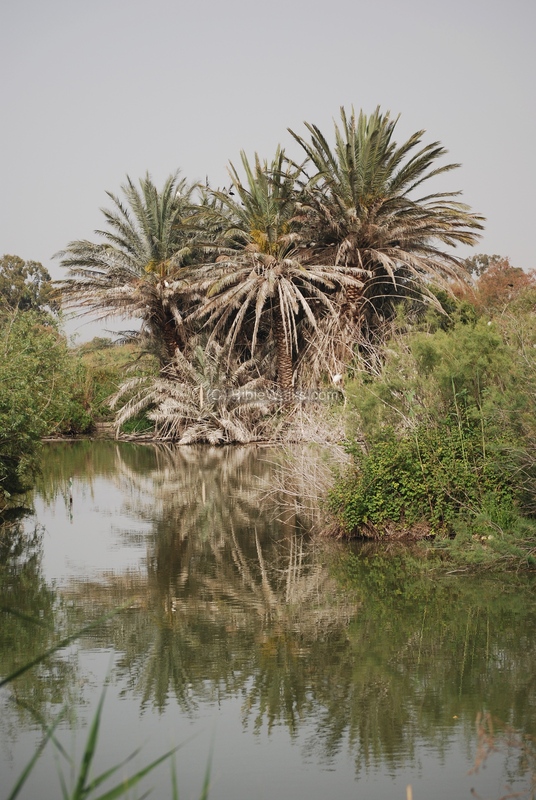 Their resting stations along the migration route are located in water lakes, such as Afek. The birds flock to the site and enjoy the abundance of water. 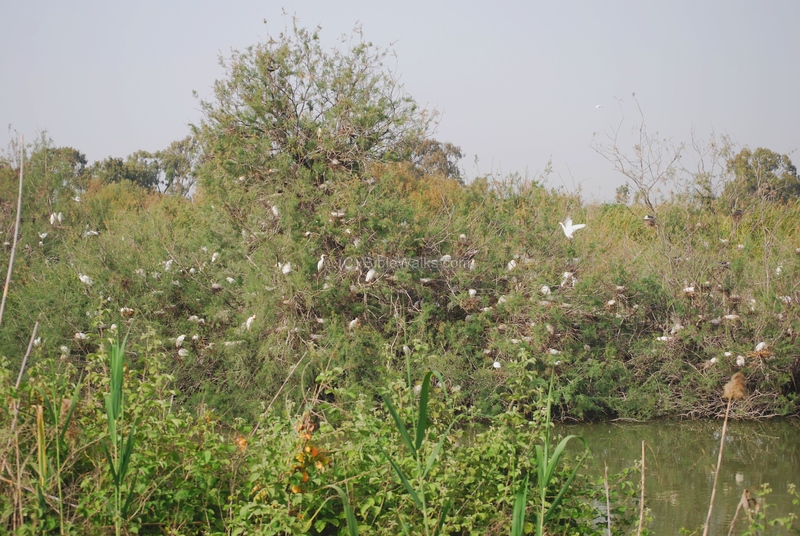 The photo below shows a concentration of thousands of white birds in one of its lakes. 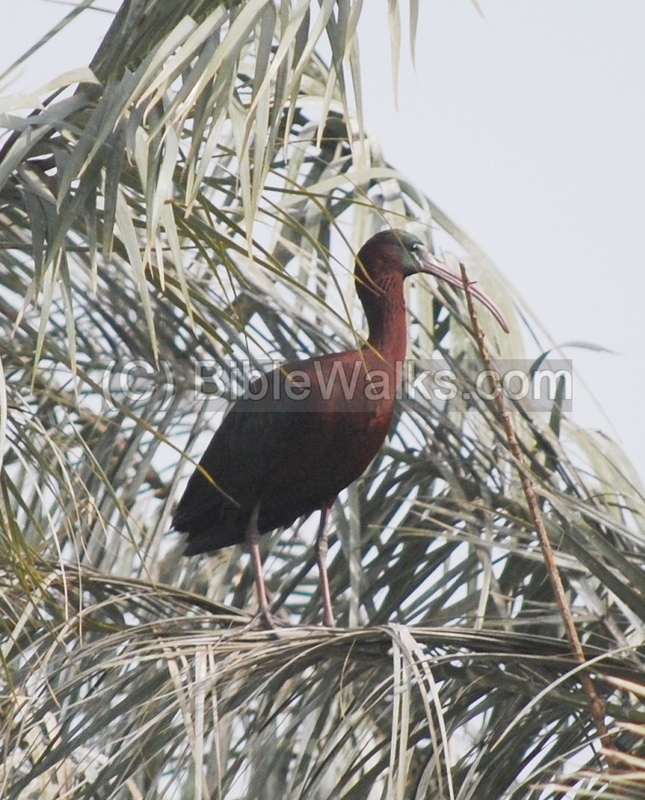 A red necked bird, identified as "Glossy Ibis", is seen in the photo below (Thanks for Mark & Cristian from the birdforum). This specie is migratory - it winters in Africa and returns during spring (when it was seen) back to Europe. The lakes are also the the home of fish, water snakes and nutria. 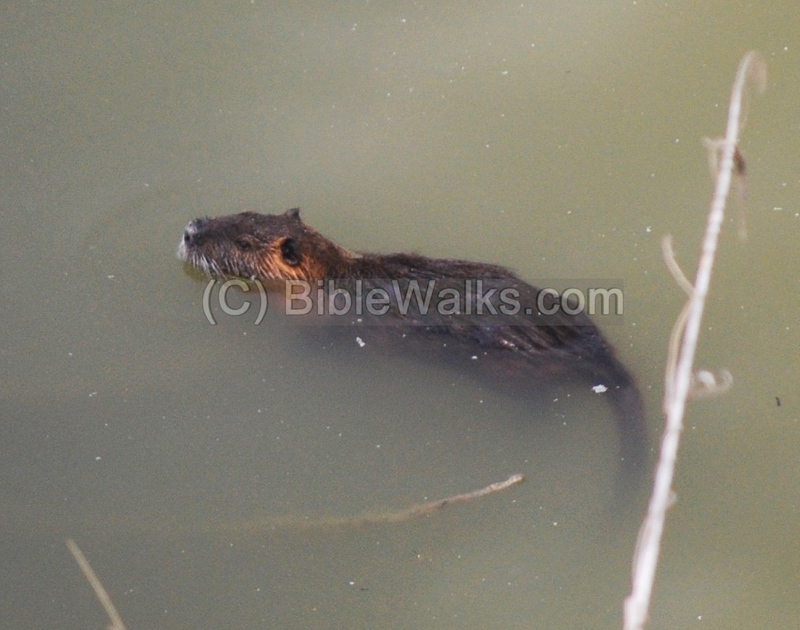 A nutria (coypu, or beaver rat) is seen swimming in the water. In order to keep the swamps clean of canes, a number of Water Buffalos (Jamus) were brought here in 1991 from the Hula nature reserve. 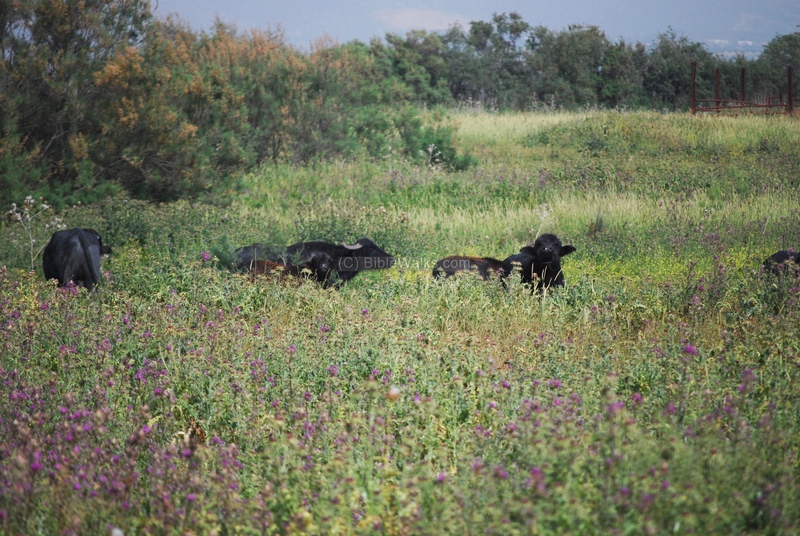 The buffalos eat up the canes and weeds. They can be seen wandering and grazing around the specially dug pond. The use of the water buffalos to clean up the swamps is used in other sites, such as in Hula lake and in the Tel Yafir (Balfuryia) nature reserve. 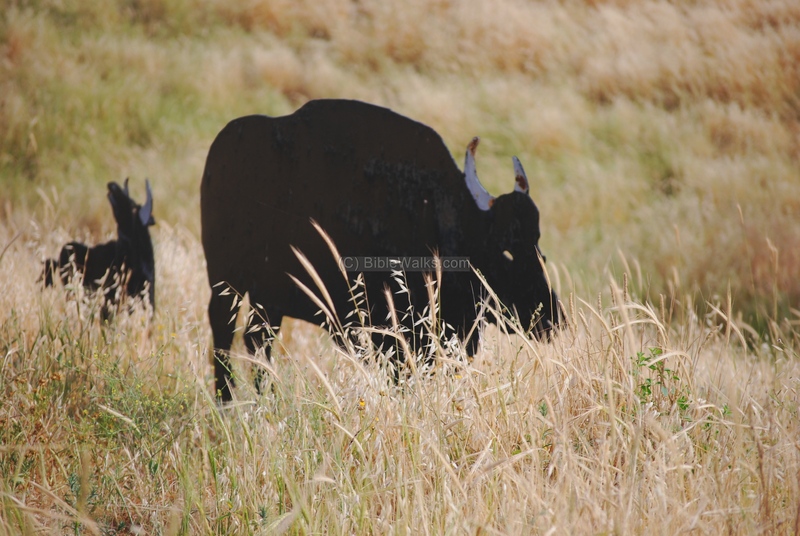 The water buffalos seen below are actually made of metal... they are are statues which are located on the top of the hill. "And the fifth lot came out for the tribe of the children of Asher according to their families. And their border was Helkath, and Khali, and Beten, and Achshaph And Alammelech, and Amad, and Misheal; and reacheth to Carmel westward, and to Shihorlibnath; And turneth toward the sunrising to Bethdagon, and reacheth to Zebulun, and to the valley of Jiphthahel toward the north side of Bethemek, and Neiel, and goeth out to Cabul on the left hand, And Hebron, and Rehob, and Hammon, and Kanah, even unto great Zidon; And then the coast turneth to Ramah, and to the strong city Tyre; and the coast turneth to Hosah; and the outgoings thereof are at the sea from the coast to Achzib: Ummah also, and Aphek, and Rehob: twenty and two cities with their villages". This text lists those cities that did not yield to the Israelite conquest. In this text the city is called Afik (Aphik), which means the source of water (the Na'aman river).
" Neither did Asher drive out the inhabitants of Accho, nor the inhabitants of Zidon, nor of Ahlab, nor of Achzib, nor of Helbah, nor of Aphik, nor of Rehob". Learn about the story of a Tel in our info page. Afek (Aphek) - also Afik (Aphik) as in Judges. Afik in Hebrew means the source of water (of the Naaman river). There were other cities with this name - such as Aphek in the Sharon. Na'aman, Naaman - the name of the creek which starts at the rich springs north-east to the Tel. The source of the name is from Arabic (Naamin), an unknown source. May have been based on Naam (yes). Kurdani, Kurdaneh- the Arabic name of the Naaman springs near the Tel. Ricordane, Recordane - the Crusader name, based on Kurdani.